What is the cost of mold removal is the first question that a homeowner commonly asks when a mold problem is identified in the home. They know that the problem is serious and it needs to be cleaned up immediately, but they are nervous about the mold cleanup cost because it can quickly add up in severe cases of mold growth. If you hire a professional, the average cost is about $3,000 - $6,000. However the cost can be significantly higher depending on the amount of mold, where it is located, and if there is any water damage to the house. For example, mold removal in an attic requires that all of the wood be sanded down which is very labor intensive. A medium sized attic mold job can cost $5,000 - $10,000. Replacing insulation and air ducts can increase that cost. This type of job is often just too large for a homeowner to take on themselves. You can follow this link if you would like to get a list of local Mold Removal Specialists that will give you a free evaluation and estimate. What Increases the Cost of Mold Removal? If you choose to clean up the mold yourself, there are many costs that need to be considered. You may have some of the necessary items at home, but most likely you will need to purchase quite a few supplies at the store. Other costs will be accrued because you will need to rent specific equipment that is used for mold cleanup. Plastic sheets and duct tape to prevent cross contamination. Negative air machines to filter the mold spores in the air and aid in the containment. A wire brush to scrub the affected area. Biocide to sanitize all surfaces. Protective clothing such as goggles, a face mask, rubber gloves, etc. New materials for remodeling such as drywall, insulation, paint, etc. Dehumidifiers to remove moisture from the air. Fans to dry the area once the cleanup is complete. New flexible ducts in the HVAC system. Testing procedures to verify that the mold is gone. Most people don’t realize that the mold cleanup cost can become very expensive, even when you are working on the project by yourself. The high quality equipment is too expensive to purchase for a one-time use, and rental costs can add up very quickly. Additionally, you need to consider the cost of mold removal in terms of time, because many hours will need to be dedicated in order to completely clean up the area. It is not unusual for a medium sized mold removal job to require 100-150 man hours to complete. In this attic mold story, the cleanup took a crew of 4 men a week and a half to complete. Hiring a professional to clean up the mold problem may seem too expensive in the beginning, but you will be surprised to see how the costs line up with a do-it-yourself project. If fact, you may even be able to decrease your mold cleanup cost by working with a professional, because they will have access to all of the equipment that is needed such as the negative air machines, air scrubbers, dehumidifiers, and large fans. There is no need to pay rental fees, because the cleanup company will include those fees in their bid. Also, a professional company may also have access to discounted prices for remodeling, because they are able to get the materials directly from the supplier. Drywall, insulation and paint can really add up, but most cleanup companies will take care of the remodeling for you after the mold is gone. If you have mold coverage in your homeowners insurance, all of these costs may be covered. Speak to your insurance company for more information. Most insurance policies will only cover the costs associated with professional remediation, so doing the cleanup yourself may actually cost you more. The picture shows mold from a leak in the central air conditioning system of a house. There was mold inside the walls as well as in the flooring. If you are trying to cut costs, be sure that you budget enough money to have the area tested by an independent contractor after the cleanup process is complete. A mold test can verify that all of the mold spores are gone, and this cost can actually save you money in the long run because it prevents the mold from growing back again. In fact, even if money is an issue, you don’t want to skip any steps in the process just to cut back on the cost of mold removal. Skipping steps may result in mold spores staying in your home, which may result in serious health problems due to long-term exposure. The mold cleanup cost is worth the money spent, because it will protect your health and prevent you from future mold growth. 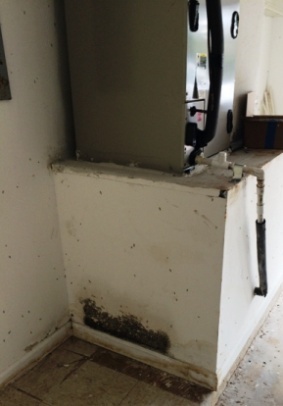 We recommend all homeowners schedule a free consultation with a mold removal specialist. A specialist will inspect your home for mold, make sure all the mold has been located, and advise you about the work that needs to be done, all at no charge to you. You can get plenty of useful information and advice from a free consultation, even if you end up opting to do the work yourself. Talk to the mold removal specialist about ways to keep costs down during your free consultation. Follow this link to get a list of qualified Mold Removal Specialists in your area. Mold Remediation Costs - Compare costs of doing it yourself vs. hiring a mold removal professional. Mold Removal Costs - Additional information on the cost of mold removal. What you should expect to pay, ways to save money, other considerations such as using mold inhibitors. 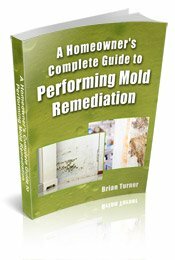 Overview of the mold remediation cost.